The USB Flash Drives became a hit during the last decade and it’s amazing how they changed our lives forever. A decade ago, we couldn’t even imagine storing so much data in just a single memory stick, and nowadays, with all that bluetooth sharing and cloud storage, it could be said that these flash drives are slowly becoming obsolete. However, it’s never a bad idea to carry a USB flash drive in your pocket because you still need to keep your important documents in one place and you never know when the internet connection would be poor when you need to access the information you urgently need. This “scarry” skeleton figure USB memory drive that takes off hiss head in order to fit into the USB port on the computer. If you have a friend with whom you spent your childhood and school days together and you have the time to show them how much you appreciate the time spent with them, you can even make a USB flash drive such as this pink old-school eraser memory stick. If you know a friend who is into Despicable Me, although it seems that everyone loves the cute and clumsy minions, you can search the internet and find the minion that fits mostly with your friend’s personality and choose it as a gift. This USB flash drive will be getting even more famous now when the Minions are getting their own movie. If you have a close person who is crazy for Star Wars, then the almighty Death Star USB flash drive will find a nice place in their pocket as well as on some of the shelves where all other Star Wars action figures are proudly displayed. 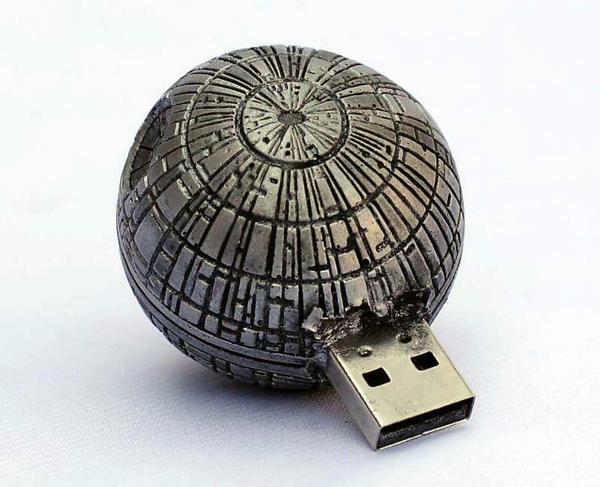 This Death Star can’t destroy an entire planet with its super laser, but it sure can store up to 16 GB of data. If you are feeling nostalgic for the not-that-good old times when we could take only 36 photos (imagine that!) by using the plastic film roll, you have a chance to revive history by choosing to buy or maybe make thefilm roll USB flash drive that will surely bring a great deal of dear memories to the person that you are giving it to, especially if they are into photography. This now is a nice gift for wine lovers but if you choose to buy them the Cork USB flash drive, make sure they remember to be careful and not mix it with the actual cork of the wine bottle that they will savor next. This memory drive looks exactly like a cork plug but it has one major difference – while the wine bottle cork usually is the threshold where memories might be lost for an hour or so, the cork USB will keep all necessary data in one place without any memory disturbances. These Babooshka dools seem creepy for some, and cool for others. If you have a friend who knows the story of the Russian Babooshka dolls and isn’t afraid of them, maybe you can get them the Babooshka USB flash drive. Do you know a close friend with a sweet tooth? Oh, well, beside buying chocolate as a gift for their next birthday, you can also try the Twix USB flash drive – it might not be as sweet as chocolate, but it can store all of your friend’s sweetest memories in one place. This Guitar USB flash drive can serve as both an affordable and cool gift for everyone, especially for someone who plays the guitar. It has up to 8 GB of memory which can well store all of your friend’s favorite music and movies for the month. Every lady loves a lipstick. USB flash drive in the form of a lipstick? Well, that is quite an invention! This might be the perfect gift for girls and women because they won’t ever use the excuse that they forgot to bring the flash drive – a woman never forgets her lipstick at home! Bracelets are also one of girls’ most favorite accessories and having a USB that serves to attach both sides of the bracelet can really be a treat. This is the Scandinavian classic leather bracelet/USB flash memory. It fits all types of clothing and does a great job storing all the data you need during your working day. The good thing about the Clé USB flash drive is that you can keep it together with the rest of your keys and never lose it. It is also light and soft, so it won’t get destroyed easily. It can store up to 4 GB of memory. And the last USB gift ideas for this post goes to your literature lover friend (do they still exist?) and the choice is a Lego Shakespeare USB flash drive which your friend will either love or hate but hopefully use it when in need of a USB memory stick.